The Palace and Park of Fontainebleau has been influential for its architecture and interior decor made by Italian artists. King Francis I, who reigned from 1515-1547, brought in painters, sculptors and architects from Italy to ornate this palace with its many frescoes and sculptures. 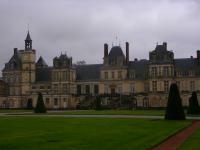 The chateau introduced to France the Italian Mannerist style in interior decoration and in gardens. The castle as it is today is the work of many French monarchs, building on the structure of Francis I: from Henri IV to Louis XVI and Napoleon. At Fontainebleau Napoleon bade farewell and went into exile to Elba in 1814. For some reason I had anticipated to find something completely different: my navigation brought me right into the center of the town of Fontainebleau, while I had expected to visit a hunting castle somewhere in a forest. At first sight the castle looks quite small and disappointing too. I wandered the grounds and part of the gardens. There are some nice black sculptures, but nothing too exciting, especially in winter. There were only a couple of other visitors around. So few of them that I wondered if the interior would be closed - I visited on a Saturday, around lunch time and had expected crowds. All changed when I paid my 10 EUR entrance fee to visit the interior of the castle. Maybe all visitors were hiding there, escaping the winter weather? No! I really was about the only person around. Most of the rooms I had to myself. This rare occasion turned it into a memorable visit. I don't think I have ever enjoyed a European castle as much as this one. I used the pretty good audio guide to explain about the castle. Each room has signs too in French and English. 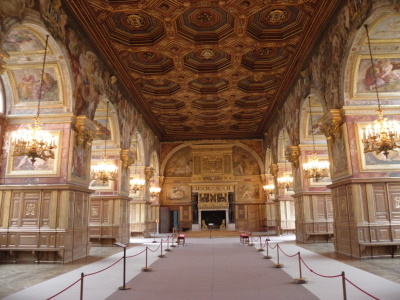 One of the best is the Gallery of Francis I, a covered passageway that he had built for himself. Its walls are adorned with beautiful frescoes. Another great room is the Ball Room (see large photo above). There's a room completely in Rococo style, rooms full of gobelins, ornate bedrooms. Almost at the end of the tour you'll find the Throne Room of Napoleon, the only such suite in France still in its original state. So in all, a very fine WHS for its interior and a good day trip from Paris or somewhere else in the Ile de France Hotspot. The Fontainebleau Castle is somewhat in the shadow of the more popular Palace of Versailles, but wrongly in my opinion. We visited Fontainebleau in September 2015 and it was far less crowded than the day before in Versailles. When you stand on the Cour d'Honneur facing the main façade, the palace looks smaller and less magnificent compared to Versailles, but the appearance is deceiving. You get the best impression of the real size and extent from the gardens along the southern front. The present appearance of the palace is the result of numerous reconstructions and extensions from the 12th to the 19th century: a sprawling complex with several wings around five courtyards, and a mosaic of architectural styles. Another difference to Versailles. The oldest and central part of the palace, a donjon of the original castle, is located in the oval courtyard. Unfortunately, this courtyard was not accessible on our visit, we could just take a look through the closed gate. The most striking element of the exterior is the horseshoe-shaped stairway at the main façade (photo), formerly the main entrance of the palace. The interiors were a real surprise: luxurious furnishings, finely decorated wooden panelling, stucco and plenty of paintings and frescoes. The tour with audioguide took about two hours. The most impressive rooms are the splendid Ballroom, the adjacent double chapel of Saint-Saturnin, and the Gallery of Francis I. Furthermore, the Gallery of Diana and the Plate Gallery full with porcelain plates fitted into the wooden panelling. All in all, we spent half a day in Fontainebleau and it was probably my most interesting and most entertaining visit of a castle on the WH list. I visited this WHS in May 2013. The park is not that impressive. The palace exterior was quite underwhelming but the interior made up for it. 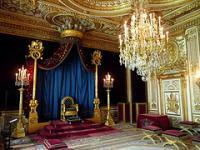 The Grand Galleries and the throne room are truly of universal value for their historical importance. When compared to the never-ending crowds of visitors in Versailles, Fontainebleau was almost empty and most probably this helped me to appreciate and enjoy the palace to the full. I did enjoy my trip out to the palace and it was a rewarding visit. It didn't feel quite as cripplingly oppressive as Versailles and was a more manageable place to get a grasp on. The level of decoration was also impressive throughout, especially the two grand corridors that we visited on the tour. Also the associations with Napoleon are pretty strong here which helped ties in some of the parts of French history that I had a decent grasp of. I also enjoyed strolling around the grounds to get a bit of fresh air. On the whole it was a worthwhile side trip from Paris, and it was good to spend some time exploring with my friends. It was also pretty easy to get to, but I must admit Palaces very rarely capture me. Less well known and thus (slightly) less crowded than Versailles, Fontainebleau started life as a hunting lodge and became the favorite residence for many French rulers, and many of them left their distinctive imprint. 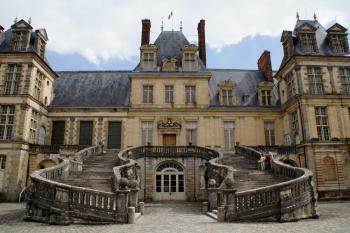 Francois I., Henri IV., and Napoleon all had an individual entrance built to the palace, and the "School of Fontainebleau" was a model for French and European Renaissance architecture. 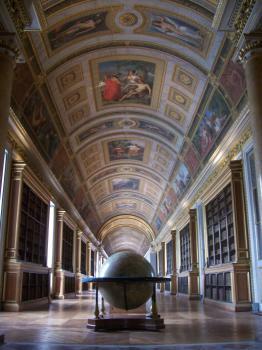 Many people will imitate the kings and prefer this magnificent complex to Versailles. I wouldn't go this far, but it is certainly very well worth visiting and one of the better daytrips from Paris. A very nice little town, just outside of Paris, that hosts a really spectacular chateau. Once a summer residence for the kings of France, the house and park became a favorite of Napoleon during this reign as emperor. There is a good deal to explore both within the apartments and around the beautiful gardens. The town of Fontainebleau itself is also worth some time, with many little cafes, restaurants, and shops to enjoy. The people are also very welcoming; we had a nice time chatting with the old man who feeds the peacocks that wander the chateau grounds. Definitely recommended as a day trip from Paris. I lived in Fontainebleau for a year while my father was getting his MBA at INSEAD business school and I must say it's the most beautiful place I've been to so far. beautiful gardens, gorgeous archticture, incredible chateaux, tiny coffee shops, extremely friendly people (myth about the French being arrogant will very quickly dissipate once you are in Fontainebleau). Because of the huge INSEAD campus right in the city, you will meet people from all over the world on the streets of Fontainebleau. 4.0: Ivan Rucek Aitia Alexander Barabanov Philipp Peterer Misio_pysio Martina Ruckova Craig Harder Antonio J. Locations for playing sport: Jeu de paume, a French precursor of tennis : "Le cercle du Jeu de Paume de Fontainebleau accueille pour la première fois en France depuis 1740 (date du premier Championnat) le championnat du Monde de Jeu de Paume. Ce titre actuellement détenu par l'Australien Robert Fahey, sera défendu pour la septième fois consécutive du 20 au 24 mai (2008) par celui-ci". Napoleon was here: In 1814, Napoleon resigned there and bade farewell to his troops before going into exile to Elba. It was his favourite residence. John D Rockefeller Jr: "1927-31 Restoration by Albert Bray of the upper sections of the Fine Fireplace wing which had been destroyed by fire in 1856. The work is financed by the Rockefeller foundation"
282 Community Members have visited.